We would like to cordially thank you for your participation in the 21st International Conference on Pattern Recognition! We hope that you enjoy your stay at Tsukuba and see you again at the ICPR2014 in Stockholm, Sweden! Photo Album: Please see the photos taken during technical sessions, reception, banquet, events and others. ICPR2012 is the twenty-first conference of the International Association for Pattern Recognition (IAPR), which will be held during November 11-15, 2012 at the Tsukuba International Congress Center, Tsukuba, Japan. Tsukuba Science City is about 50 km northeast of Tokyo and 40 km northwest of the Narita International Airport. The Haneda International Airport is 10 km south of Tokyo. The Tsukuba Express Line connects Tsukuba/Akihabara in 45 min. ICPR2012 Photo Album is now available. Note that the ICPR2012 Organizing Committee will retain only the copyright of the papers published on IEEE Xplore. Prizes and Awards Information:Two major IAPR prizes, as well as paper awards in four different categories will be presented at ICPR 2012. Banquet Information: Note that Conference Banquet will start at 19:30 on 14th (Wed.) at Hotel Grand SHINONOME. All participants are required to wear the name badge holder WITH STRAP. ICPR2012 webapp for mobile devices is now available. 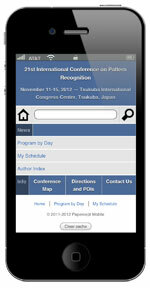 For the convenience of ICPR2012 participants, we offer a special webapp for mobile devices including technical program by day, author index and your customized schedule. Please enjoy the conference. Welcome Reception and Banquet information is updated. ICPR2012 will offer free TX-train tickets to students attending from overseas. The ICPR2012 organizers desire young overseas students come in touch with Japanese cultures at this opportunity. So, we will offer one round-trip ticket (return ticket) from/to Tsukuba-Akihabara to every overseas student at the conference site. Please do not forget to bring your Student ID when you travel to Japan. Conference Venue and Travel Information are updated. Floor map is available now. Room and Timetable of Workshops, Tutorials and Contests are now available. Plenary Speakers (K.-S. Fu Prize Lecture, J. K. Aggarwal Prize Lecture, Keynote Lecture) and Invited Talks are updated. The technical tour information is partly updated. Presentation instructions for the poster shotgun session is partly updated. The final submission method is announced soon. - Message of the President of Japan National Tourism Organization (JNTO).